Recently I put together an article about the VW W8 Passat, a car so needlessly complicated and expensive to operate I was sure it was the most infamously unreliable Volkswagen in modern history. Then the V10 Touareg showed up and blew my mentions into smithereens. The VW Touareg V10 TDI was, simply, one of the coolest cars ever made. Like, ever. Volkswagen superboss Ferdinand Piëch was in the midst of his obsessive goal to make the best cars in the history of the world, an era that gave us the 250 MPH Bugatti Veyron, the 260 mpg Volkswagen XL1, the W12 Phaeton and maybe-possibly-nearly the W12 supercar. 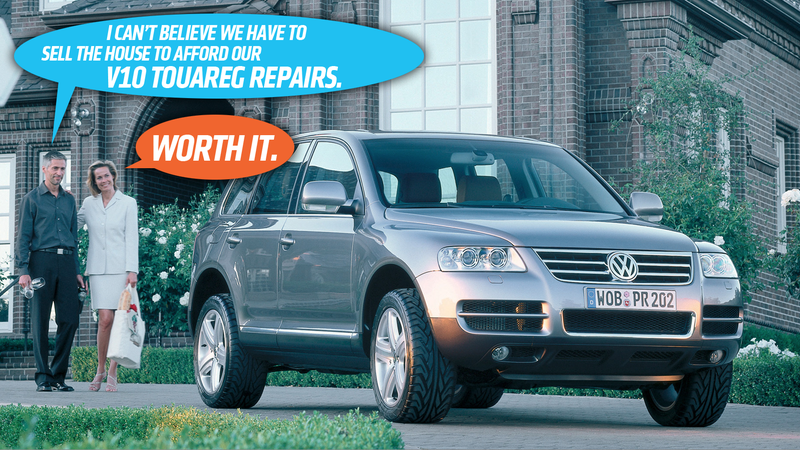 The 2002 Touareg itself was a wild engineering project for blue-collar Volkswagen. It wasn’t exactly a sales hit because it was painfully more expensive than other full-size SUVs, and it was expensive because it was too luxurious inside and too meticulously engineered for its own good. And then Volkswagen stuffed a 10-cylinder twin-turbo 5.0-liter diesel engine into the front of the thing, an engine larger than some minor principalities that comprised pre-1871 Germany. In short, Volkswagen made the already complicated Touareg even more complicated. Any sane person ran screaming from the dealership. However, the siren song of diesel was strong at the time. We only briefly got the V10 Touareg here in America starting in 2004, taking a break for emissions compliance (foreboding!) then returning again for 2006. Remember that this was when hybrid cars were picking up into the mainstream with the Prius. By contrast, diesel’s promise of an economical, largely foreign kind of engine tech with tons and tons of torque appealed to lots of American weirdos. Most Americans thought of diesels existing in two sorts of realms at that time: Either tiny, huffing economy engines in the fronts of wheezy VW Rabbits or slowly chugging boats around being sooty Chevy Suburbans. Volkswagen Group was betting big on diesel in this period, with their Audi Le Mans winners going diesel in ‘05. It was a chance for some prestige for the German carmaker, going at the fuel economy question sideways. This Touareg was a first: Ahugely powerful, clean, luxurious diesel. It was a wildly expensive one, too. The price was around $70,000, about 30 grand more than the cheapest Touareg available, as AutoBlog noted in a 2008 review. The cost turned away all but the most obsessive Euro-types here in the States, people who could have afforded any and all repairs. Then these Touaregs joined the used market, like silent bank account killers. 1. One turbo failed. This required dropping the entire drivetrain out of the bottom of the vehicle. ~30 hours and special equipment and a ~$1400 turbo later, it didn’t work right. And that was the dealer master mechanic “fixing” it. I won’t get into things like the dealer breaking and then re-installing the broken driveshaft, as I blame that on the dealer. I actually bought an aftermarket warranty that paid for $7k worth of work conducted in that one year of ownership. I then sold it - firesale style - and it had drivetrain issues. I believe alternator, turbos, thermostat/cooling system work.... you have to drop the motor. And when I say drop the motor, I mean drop the drivetrain. And when I say drop the drivetrain, I mean use a special lift and tools that can handle the weight of an aluminum-block 5.0 liter diesel engine and transmissions. Seriously, parts were scarce but the main thing that made me sell it is no one could work on it and even the knowledge base online was scarce. It was terrifying to own as a DD because you literally could have a part fail with no warning and struggle to source parts and a reliable mechanic to do the work within weeks. I was waiting to pipe in the same. The W8 is a camry (ok, maybe more like a 10 year old former rental car Malibu) compared to the V10 TDI. I still own one and just in the last 6 months it’s cost me $4280 (failed center drive shaft bearing, failed glow plug and had all 10 replaced). It’s not hard to find a V10 Touareg for sale in America for between eight and 16 grand depending on condition, though they get snapped up fast by superfans. I myself would advise you buy something a little easier to live with instead, like an Eagle Summit that’s filled with live snakes, or a 1990s Ferrari.